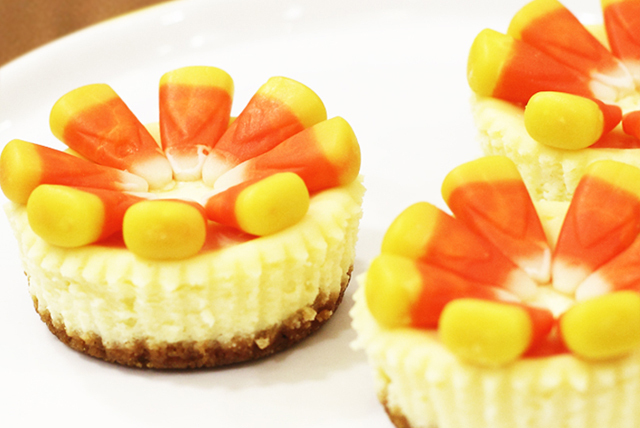 After carving up pumpkins to make jack-o'-lanterns, you'll appreciate how easy our mini cheesecake versions that are decorated with candy corn are! Beat cream cheese, sugar and vanilla in large bowl with mixer until blended. Add eggs and food colorings; beat until blended. Place 1 cookie in each of 12 paper-lined muffin cups; cover with cream cheese mixture. Bake 20 min. or until centers are almost set. Cool completely. Refrigerate 2 hours. Decorate with candy corn to resemble jack-o'-lanterns just before serving. Have fun making this spooky, Halloween treat with your kids. Then, enjoy 1 mini cheesecake each. Substitute vanilla wafers for the OREO Cookies.